At the exhibition of the JuniorMuseum children between the age of five and twelve can discover a whole lot of exciting things: The three exhibition rooms invite you to go on a journey: to the Tuareg in the Sahara desert, to the aborigines in Central Australia and back to the metropolis Berlin. How do people find their way about in these places? How does a boy feel when he is allowed to go on a caravan journey for the first time? How do you wrap a Tagelmust, the face-veil worn by Tuareg men? You have to try it out yourself, of course! Or you can crawl into a cave and follow the path of the honey ants in the Australian desert. Do you think the honey bubbles taste good? Mysterious tracks lead through the room and there are many different traces to discover. Somewhere you can hear the snuffling and skipping of a wallaby, a little kangaroo. 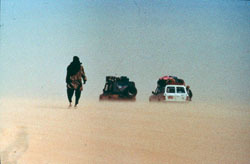 In Berlin, too, there are people who travel a lot, who live almost like nomads. The fastest of all connections to places all over the world is a very special path sometimes described as a data-highway: the internet. This, too, can be tested here - but it is not the only point of contact with the two other destinations. This is an exhibition where everything can be touched, tried, felt. Explore with all your senses: experience the feeling of hot desert sand under your naked feet or the view of a very big city from high up on a balcony. Get your explorer kit and your explorer diary (2 Euros) and off you go! Our knowledge cards, little films and sound stations help you along on your journey of discovery. Children's tour every Sunday at 2 pm.